Rethink, re-examine and re-calibrate how you lead. Our April 15-17, 2019 Program is sold out. You can register for one of our next two programs below. Join top metals industry executives at the Historic Thayer Hotel at West Point on the grounds of the United States Military Academy in New York. Space is limited and is already filling up fast. Please register soon. The registration fee of $5,495 covers educational materials, hotel stay and meals during the program – everything but your travel to and from the Thayer Hotel at West Point, NY. Time-tested prowess in leadership development using TLDG’s unique 4-Pronged Approach to leadership development, which is grounded in the leadership principles from the Army and West Point. 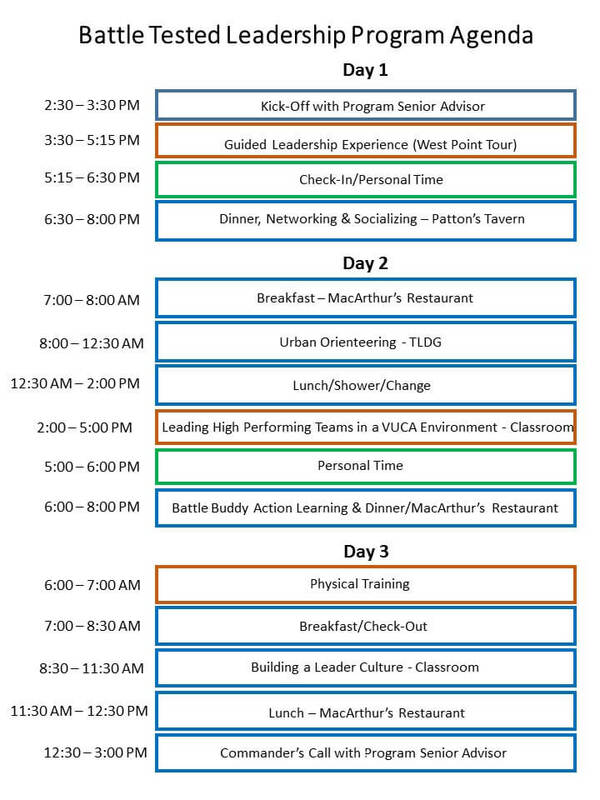 Unparalleled experiential and team building exercises–leveraging the Hudson River Valley and West Point’s history, geography and beauty–that directly reinforce leadership principles of strategy, communication and trust. Unique opportunity to engage retired General Officers and Senior Advisors in the leadership program 24/7. Senior Advisor serving as a coach and mentor to provide personal insights on how he or she used the principles discussed, facilitating strategic conversations, and helping develop action plans for your business environment. World-renowned speakers who embody being “leaders of character”, including retired General Officers, Medal of Honor recipients and space shuttle astronauts who provide culminating motivational speeches. Thayer Leader Development Group (TLDG) at West Point builds leaders with a simple premise: character is foundational to your ability to lead. Combine this with knowledge and action, and you unleash the “whole” leader every organization needs. This approach has been proven by over two hundred years of application in the United States Army – it is the reason TLDG makes its home at The Historic Thayer Hotel on the grounds of West Point. At TLDG, like nowhere else, you’ll experience the legacy of military leadership lessons from those who have powered and led a nation. And today, empower organizations to adapt and thrive. True leaders, TLDG believes, courageously enact change, master opposition, foster productivity, and respond decisively. It’s not enough to just know about leadership. The Thayer Leader Development Group spans the gap between knowing about leadership in theory and acting like a leader when it counts. TLDG builds leaders in the same time-honored tradition that has helped build one of the world’s most powerful nations. “Very moving. Powerful experience. Taught just as much about life as business.